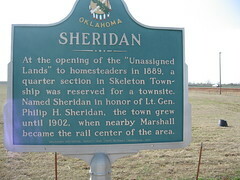 Sheridan At the opening of the "Unassigned Lands" to homesteader in 1889, a quarter section in Skeleton Town- ship was reserved for a townsite, Named Sheridan in honor of Lt. Gen. Philip H. Sheridan, the town grew until 1902, when nearby Marshall became the rail center of the area. 5miles west OK highway 51/74 on OK 51. West of Roxanna, Oklahoma. Signs on south side of highway. 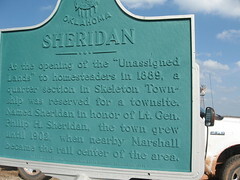 Sheridan Cemetery is located south of sign on Highway.